Mentor, OH—The Mentor Ice Breakers out-shot the visiting Danville Dashers 54-24 and controlled play for the majority of the game on Friday night at Mentor Civic Ice Arena, but a stretch of three Dashers goals within the span of 4:41 early in the second period and a game-winning goal from Justin Brausen sent the Ice Breakers to a 4-3 overtime loss. Mentor had a ton of energy in the early goings, piling up 21 shots on goal in the opening frame compared to six for Danville. Matt Kadolph put the Ice Breakers in front just two-and-a-half minutes into the game, deflecting Dzmitry Daniliuk’s slapshot from the left point past Dashers netminder Matt Kaludis. Steven Fowler contributed the second assist on the goal. The Ice Breakers stretched their lead to 2-0 at 18:58 of the first when Daniliuk fired a slapshot over the shoulder of Kaludis on the power play. Joe Swenson and Nate Farrington both added assists on the goal, which was the second of the season for Daniliuk. Danville took control of the game with a flurry of goals after coming out of their locker room following the first intermission. Eric Masters started things off on a 5-on-3 power play just over a minute into the second period. Brausen tied the game at 5:40 off assists from former Ice Breaker Ryan Alves and Nathan Campbell. Only nine seconds later, Brandon Contratto scored to give the Dashers their first lead of the night. Brausen and Campbell both assisted on the goal. Danville’s hot stretch forced Mentor Head Coach Iain Duncan to make a goalie change, pulling John Sellie-Hanson from between the pipes after the Fargo, North Dakota native gave up three goals on 12 shots. Derek Moser entered the game and managed to keep the Dashers off the board for the remainder of the second frame. With Danville holding a one-goal lead early in the third period, Ice Breakers forward Nate Farrington was knocked down with a hard hit behind the Dashers’ net. Farrington got up, skated in front of the net, and immediately finished a one-timer off a beautiful pass from Daniliuk to tie the game. Gordy Bonnel also assisted on the goal, pushing his point streak to 13 games. Both teams traded chances throughout the remainder of the third period, including a couple of close calls in the Dashers’ offensive zone in the final seconds of the frame. 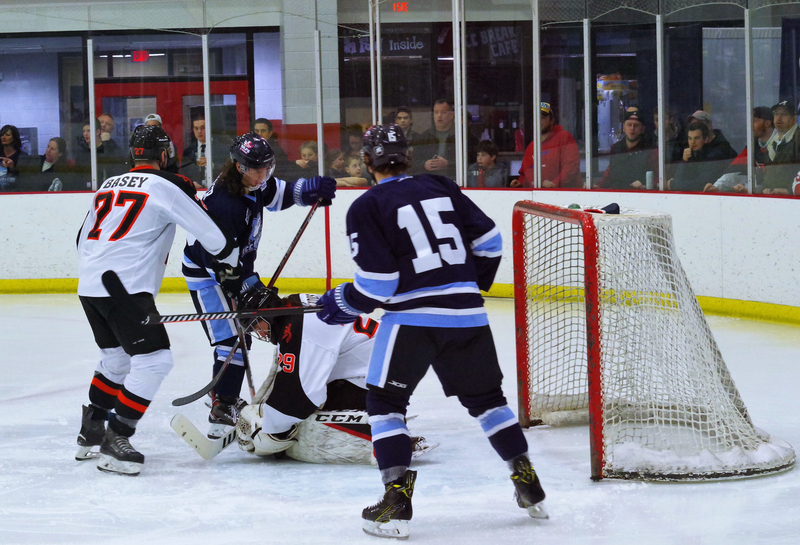 The ensuing overtime period was the Ice Breakers’ second of the season and their first on home ice. The excitement was spoiled just over a minute in the extra period when Brausen beat Moser on a wrist shot from the left side to give Danville a 4-3 victory. Campbell notched assists on all four Dashers goals while Brausen had a four-point night with two goals and a pair of helpers. Moser stopped 11 of the 12 shots he saw while Kaludis had a busy night, making 51 saves en route to his sixth win of the season. These two teams are back in action tomorrow night in Mentor to wrap up the two-game series.